To integrate new service components successfully into an existing system a special gateway technology is required. It combines in-house and external system elements although they are consisting of different interface definitions. Simple, quick and without complex changes to the established system. The best case scenario is to combine all kind of external services with in-house products. Therefore, all modules and business processes should be integrated into the Mid-/Back office – including the handling of payment. 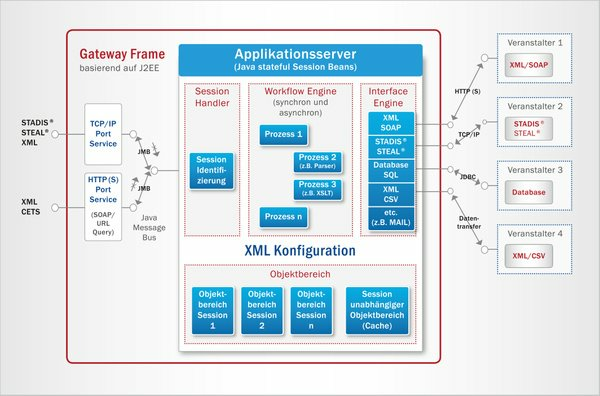 The Dynamic Gateway Frame is about basic functionality, which can be configured and implemented quickly into an individual gateway. It consists of a configurable interface- and workflow engine for the operation of interfaces and process control. Session handling for buffering of any data which is needed during a process. Configurable Interface-Engine on XML-Basis for utilisation of different interfaces. Workflow-Engine for controlling different processes based on received data within the Interface-Engine. Supply of external services in the frontend including integration to existing mid- and backend systems. Verification of frontend information for the relaying to other systems. The Gateway Frame is set up in most advanced highly performant Java technologies. High stability and scalability by utilisation of common Application-Server (e.g. BEA WebLogic® or JBOSS). No special hard- and software platform is necessary. The configuration of all interface- and workflow descriptions is based on XML. By pre-setting the adapted Gateway Frame, adjustments to existing gateways are unnecessary. Highest data security via SSL-encryption and firewalls. With DynaPack®, services of different providers can be combined and stored in a shopping basket and can be booked online as a complete travel package. DynaGate® for example provides the possibility for a complete CRS/GDS connection or the use of the STEAL®- or XML technologies for utilisation of dynamic part-templates in the CRS systems without adjustments to existing gateways.